Medi-Solve's technique can mask medical devices selectively, as shown by the unmasked folded balloon (above) and the masked folded balloon (below). Before lubricious coatings are applied to such medical devices as catheters and guidewires, sections of the devices must be masked to ensure the retention of such necessary physical characteristics as friction. However, because standard methods of masking medical devices can result in a host of processing and performance issues, Medi-Solve Coatings (Natick, MA) has developed a masking process that the company claims is more versatile than the standard methods and involves fewer risks of product damage. "Typical techniques for masking the outside of such medical devices as catheters include wrapping it with a material such as Teflon tape or a tape with an adhesive backing," explains Art Madenjian, vice president of technical sales at Medi-Solve Coatings. "Wrapping, however, can be labor intensive; it is best suited for products with a constant shape and does not necessarily prevent coating material from seeping underneath the Teflon tape." While adhesive tapes may be suitable for devices with uneven profiles and can help to impede seepage, their adhesive backing can damage the balloon, Madenjian adds. In contrast to these procedures, Medi-Solve's masking method is well suited for products with varying geometries because it follows the contour of the object, Madenjian says. Moreover, it does not require the use of a solvent to apply the mask to the device. A watertight material, the mask can also be removed easily without damage to the product, and once it is removed, it leaves no residue behind. In one case, for example, the company's method was used to mask the lumen in a catheter application. The distal tip of the catheter had been skived a few centimeters along its length and halfway through its circular internal lumen, creating a crescent-moon shape. 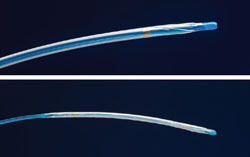 Initially, a Teflon mandrel was used to block off this lumen, but when the mandrel was removed after the coating process, a ridge of coating material was left behind where the mandrel touched the catheter. In addition, some coating material seeped under the mandrel and was deposited inside the channel. "In this application, our masking material worked well, Madenjian comments. "It was quickly deposited along the length of the exposed internal lumen, filling the crescent shape and creating a liquid-tight seal. After coating, we removed the masking, leaving a clean lumen." Similar to lubricious coatings, the masking material can be applied using spraying, dipping, and wiping methods. After being applied in liquid form, it solidifies at room temperature in a matter of minutes. Following the coating process, it is dissolved away using a safe, common solvent. "This system requires fewer steps and is faster and easier to implement than other techniques," Madenjian notes. "It's also more versatile and involves fewer risks of product damage, which can be costly for finished products." In addition, the process reduces the need to rework or deflash the coating if it should be applied inadvertently to unintended areas of the device.